As a school of inquiry, innovation, and impact we are designing programs and spaces that allow students to explore their questions, passions, and interests in a hands-on, experiential learning environment. 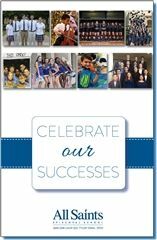 All Saints focuses on helping each student identify his or her individual talents and areas of interest and then teaches students how to build on those gifts for a lifetime of success. All Saints provides an inclusive, nurturing Christian environment where students reach their full potential academically, athletically, artistically, and spiritually as we ignite passions to impact our world. All Saints is accredited by the Independent Schools Association of the Southwest (ISAS), recognized by the Texas Education Agency and the Southwestern Association of Episcopal Schools (SAES), and a member of the National Association of Independent Schools (NAIS) and the National Association of Episcopal Schools (NAES).